119'of affordable Highland Lake waterfront! currently there is a camp with an open concept with one bedroom. 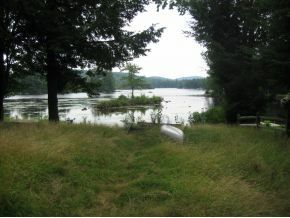 10yr old septic built for 2 bedrooms, well, 3 year old exterior siding and paint, 4 year old roof, private road,enjoy simple living, furnished, as is all inclusive, boat, motor, lawn equipment on .26 acres.